“Serious Moonlight” (sold) – a pair of simple yet beautiful gemstone layering necklaces. 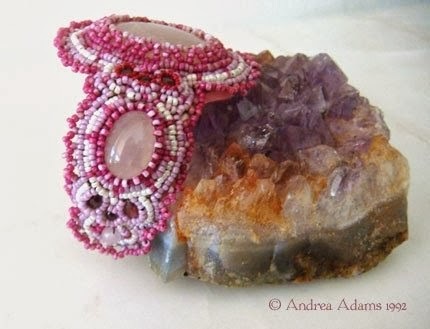 These are less intricate – and thus, more affordable – than a lot of my beadwork, and they were fun to make. I’ve already had requests for more like these, and will do my best to comply as time allows. “Blackstar” – Labradorite and sterling silver with charcoal glass beads. “Owl & Moonstone” – A carved leather owl on the wing, with Welo opal and moonstone. 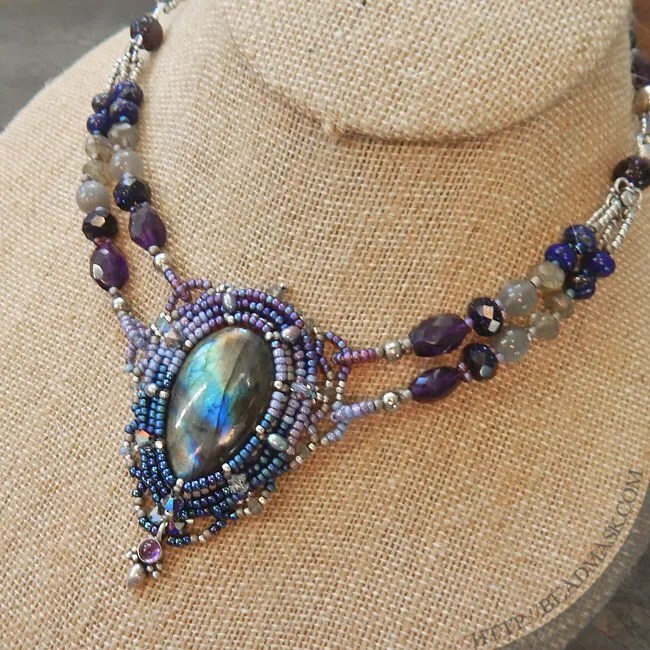 “Eclipse” – Labradorite, hematite and freshwater pearls, set in dusky blue seed beads. Oh – and I’m trying something new with this update, and including tidbits about symbolism and folklore. Over the years I’ve come to realize that many people wear jewelry as symbols or reminders of ideas that are special to them (mothers’ rings, for example) so I’ve included some of that info. Believe it if you need it, if you don’t just pass it on. There are a few stragglers that still need finishing touches and/or better photos, so they’ll be added as time allows. I’ve needed to rebuild my jewelry selection for months now, and this feels like a good start! I’d like to share this first image in acknowledgement of one of our most dedicated coordinators, Rosa meyer. The bright blue squares (“our beads help…”) were her brain child, and this theme is repeated at the center of each of the 3 quilts. The one for DC has a series of red squares that read “Our beads help to remember the fathers, the mothers”. 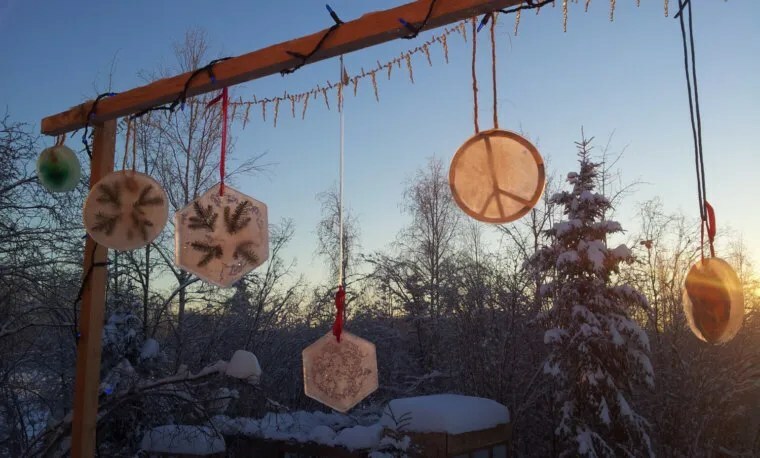 The one for PA has white squares that say “Our beads help to comfort the sons, the daughters”, and the one for NY (shown here) has blue squares with the words “Our beads help to honor the heroes, the victims”. Thank you Rosa for your enduring passion and commitment to this project, and for keeping it visible in the (many) years that we searched for permanent placement! The 4 squares shown in this image were created by Julia Pretl, who was not only our coordinator for the MD area, but our (extremely talented) web designer. She helped to problem solve for the BQ project starting from day one, and on up to nearly 10 years later, when we finally secured permanent placement for the quilts. Thank you so much Julia, for all your help and for putting up with so much of my crazy over these past 15 years! This block includes squares by our NM coordinator, Nikia Angel (thank you Nikia!) as well as Rita Sova (angel) , Lisabeth Tafoya (in high resolution microbeads!) and the ever awesome Mary Tafoya. Her square commemorates the life of a NM man, Al Marchand, who was a flight attendant on flight 175. Notice how several of the squares in this block are from Japan? There are many others throughout the quilt, most with the same red/yellow/green pattern as the one in the lower left corner. These came from a group of Japanese artists who worked on their squares together … many of them learned how to bead in order to participate in this project! This block represents some of the MANY beaded squares collected by our AK coordinator, Jeanette Shanigan (I don’t remember exactly how many AK contributed, but it was a lot! Jeanette will tell you the exact #). The one in the lower right (by Karen Palmer) showcases one of the most popular designs used in the quilt, a rose/flag motif, designed by my sweet friend Charlene Hughes, who was our CA coordinator. Next to that (lower left) is a square by Kate Boyan, which especially touched my heart. She has been – and still is – one of my favorite bead artists, so it was a wonderful surprise to me when her square came in! 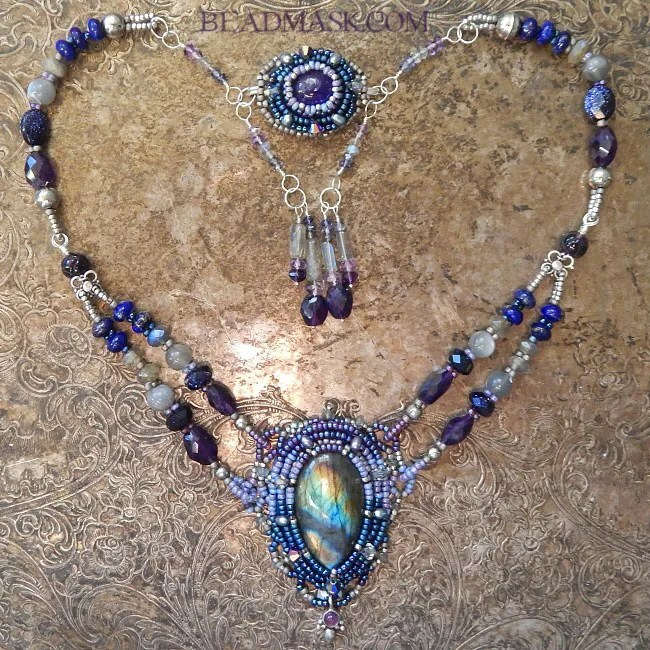 There were many “famous” bead artists who contributed to this project, but to me they were all just good people coming together for a special cause … in her case, I have to admit to feeling a bit star struck! These two squares by Anne Brazeale of AK are just a small sample of the many squares that we received from Native American beadworkers. I think she is Tlingit, but perhaps one of the beaders from the Mat Su Valley Bead Society will see this and let me know for sure. There are so many special stories that I could share about these squares, and about our travels with the quilts as we worked to find permanent placement for them! I need to get on with my day today, but I will try to remember to share more of these as time allows. Many thanks to all of the wonderful people who helped with this project – artists, coordinators, supporters, viewers, and more. I appreciate you all, more than I can say. Time to play with my beads! Now that the Halloween rush is over, I’m finding a bit of time to play with my beads again! 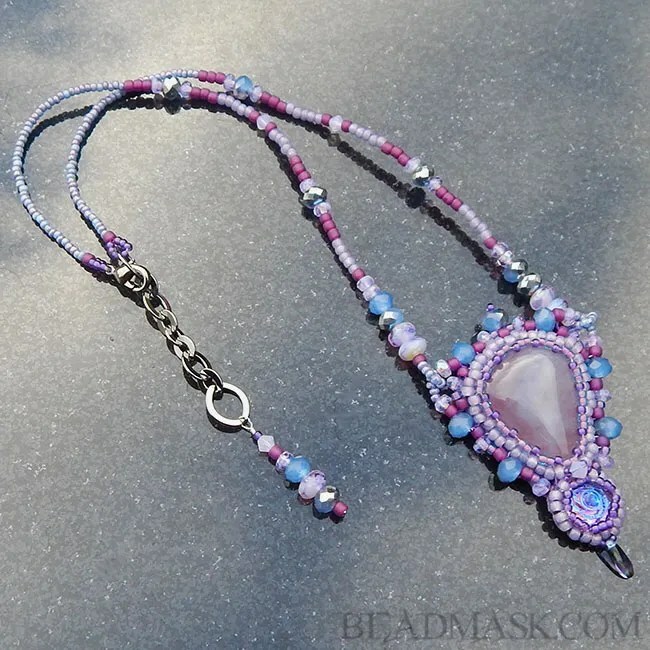 This beadwoven necklace showcases a purple chalcedony cabochon and a little vintage rose cab with fabulous play of light effects. The colors are a mix of orchid, lilac, fuschia and periwinkle. Just wanted to share this recent photo of a happy customer. 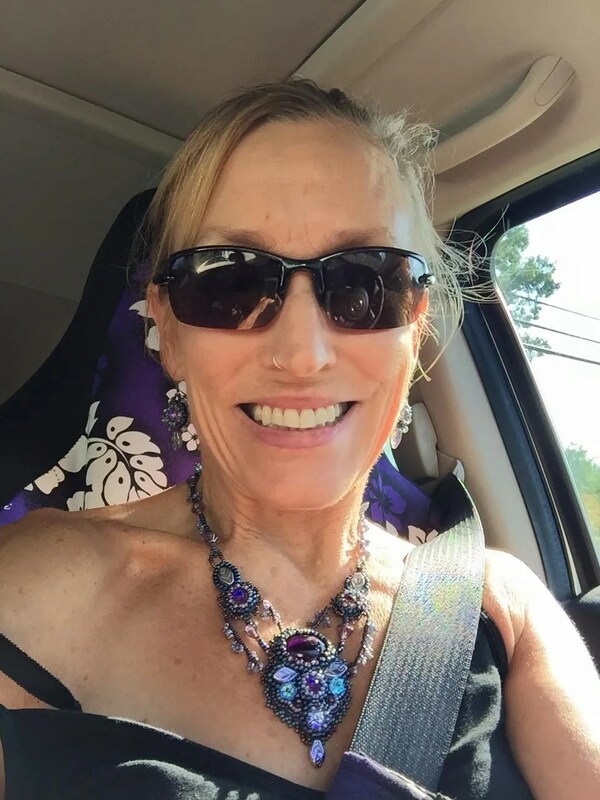 Thank you Anna, for sharing this image — it makes me so happy to see my work being worn, and to know that it makes you happy! 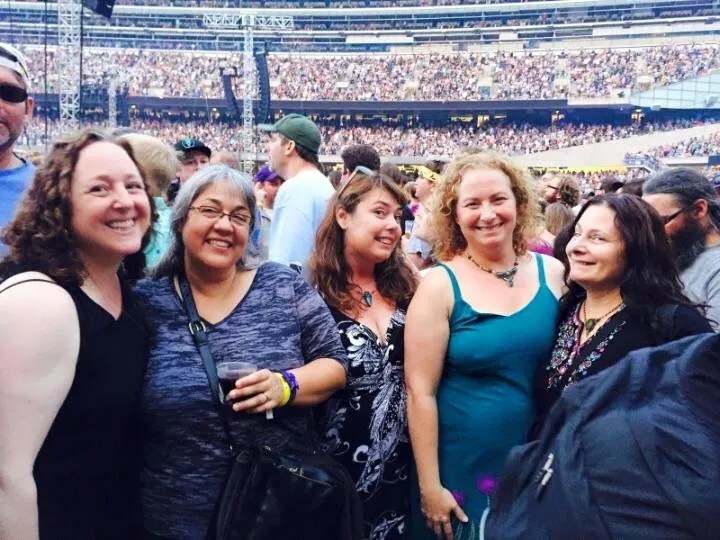 This photo was taken at the Grateful Dead’s 4th of July “Fare Thee Well” shows. It’s particularly special to me, not only because it’s a photo of some of my favorite people, but because it represents a much needed realization and a shift in perspective. Sales have been lean since Etsy jumped the shark, and it’s been hard not to take that personally. The lull in business has made it hard to get by and frankly, it has caused me to question my creative work as well as my sanity! There were several times that weekend when I looked up and realized that ALL of the beautiful women surrounding me were wearing my beadwork! These ladies are not only beautiful, they are powerful… healers, teachers, mothers, artists and so much more. It dawned on me that all of these goddesses that I admire are rocking MY work — and many of them have chosen to do so for decades! Seeing this was an incredible affirmation that my work – and its maker – will be just fine. Have you seen this cuff? Have you seen this cuff recently? It’s a piece that I made several years back. For the past two days, my website has been flooded with direct hits searching for this image (it was moved to a different file, which is why those hits are coming back with a 404 😉 ). I’m guessing that it was posted to a beading forum or something? Can anyone tell me where? I’d just like to know why my site is blowing up! And for what it’s worth, the image can be found here now. Feel free to share it with proper credit, and if you know why so many people are suddenly interested in this piece, please let me know! This little fellow has been buzzing around my studio for far too long, waiting to become… something. I just started playing with it again recently. It’s been a long chrysalis, but hopefully it will fly soon! 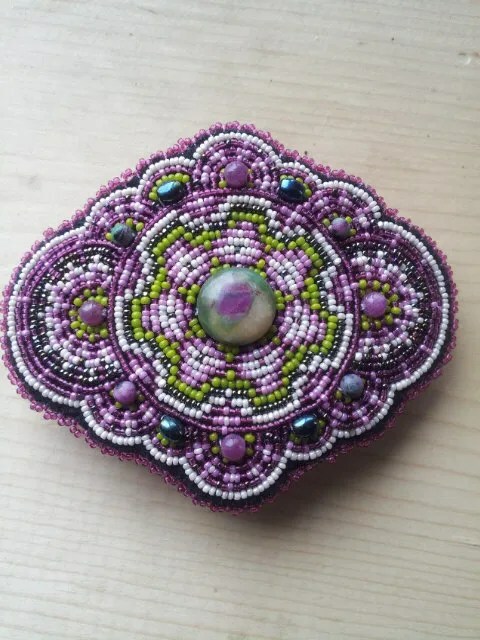 Throwback Thursday — an early beaded cuff, done in size 15/0 seed beads. This bracelet incorporates a series of semiprecious stone cabochons, including 3 rose quartz and 12 tiny faceted garnet cabochons. Circa 1992.